There are many of iPhone data recovery software on the market. It makes people in a real need hard to make a choice. But the quality is mixed. wrong choice can cause data be risky and unable to recover again. How to choose a best iPhone file recovery software? 2. High success rate of recovery. It determines whether you can get back your data or not. 3. Compatibility, working for all iOS versions, at least the version working on your iPhone 4 and later. 4. Intuitive interface and Less recovery steps, no requirement for technical skills. 5. File types for recovery, able to recover contacts, messages, notes, photos, video, etc. Bitwar iPhone Data Recovery is a best iPhone file recovery software that satisfies the above conditionsfor Apple users. 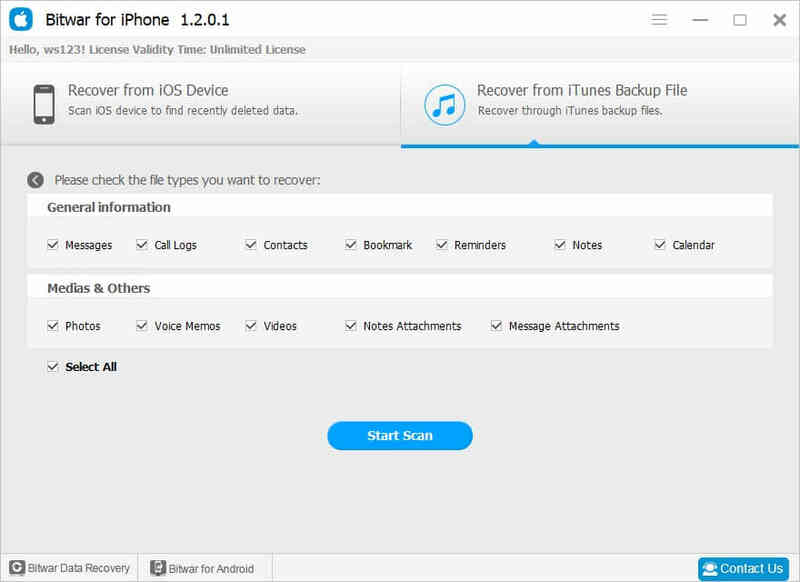 It allows you to recover iPhone/iPad/iPod data including Messages, Call logs, contacts, bookmark, Videos, Photos, Notes and more with 3 steps. Whenever you encounter data loss due to accidental deletion, iOS update, jailbreak failure, or iDevices get lost, stolen, broken or locked, Free iPhone Recovery software is always your best choice to rescue important data from iPhone, iTunes backup. Download this best iPhone file recovery software on this URL: https://www.bitwar.net/ios-data-recovery-software/. Compatible with iPhone 4/5/5c/5s/6/6s/6 plus/6s plus/SE/7, iPad Pro/Mini, iPod Touch 4/5 and more iDevice running iOS 11/10/9/8/7. You need to install iTunes before installing Bitwar iPhone Data Recovery. Itunes can provide modules support for Bitwar iPhone Data Recovery software. Download iTunes：https://www.apple.com/itunes/download/. Bitwar iPhone Data Recovery software supports two operating systems: Mac OS and Windows OS. Download and install Bitwar iPhone Data Recovery or Bitwar iPhone Data Recovery for Mac according to the system. Launch Bitwar iPhone Data Recovery and connect your iPhone to the computer through the USB cable. Make sure iTunes is installed previously. Select the default recover mode "Recover from ios Devive".this mode will recover data without backup files. the software will quickly scan the device to find all the existing and lost data. You should keep device connection during operation. During the scan, you can “pause” or “stop”scanning to preview and recovery lost data. When the scan is finished, data on the iPhone will be displayed in different categorizes which is listed in the left panel in the program, such as Messages, Call logs, contacts, bookmark, Videos, Photos, Notes, etc. You can click these options and preview the detailed contents to find your target files. Mark them one by one and then click "Recover" button to save them on your computer. This operation recovered the lost data of the iphone successfully. We need a iTunes backup, whether before or after deletion. Make sure you've backed up your iphone before. If you have not backed up before, you can back it up now. Start the Bitwar iphone data recovery program and connect your iPhone to the computer with a USB cable. Select the recover mode "Recover from iTunes Backup File"on the home page and select the backup file in the selection list which you want to recover data from. If your iOS backup file is not listed here, it is probably because your ios device has not been synchronized with itunes, You can manually find the backup file out from other folder by click “Browser...” . The program will begin scanning itunes backup to find all the existing and lost data. Please keep device connection during operation. When the scan is finished, the program will list all selected types in the left panel and the scanned data are categorized in types, like recover from ios Devive.You can click these options and view them to find your target files. then select them and click "Recover" button to save. The data will be saved into your computer too. This operation also recovered the lost data of the iphone successfully. As you can see, The program has two ways to recover your lost data from the iPhone, and It provides a much flexible option for only recovering the desired files instead of recovering all the files as a whole, which will definitely save time and precious disk space. So let's download it to have a try? Next：How to recover deleted text messages on iPhone?